A few peo­ple have asked me for more details on my writ­ing process so I fig­ured the eas­i­est thing is to doc­u­ment it here. This about the lit­er­al process of how I put togeth­er my projects. My main edi­tor these days is Kate. Kate is a plain text edi­tor but since it’s part of the KDE project it comes with a huge num­ber of slick fea­tures include vi mode (vi is an unbe­liev­ably pow­er­ful edi­tor once you make it past the learn­ing curve). I use LaTeX markup for every­thing (more on that lat­er). Each project gets its own fold­er (cur­rent project is named “ham­mer” due to an old work work­ing title). Each chap­ter is split in a cou­ple files but how many depends on my mood when I worked on that par­tic­u­lar piece (you can see in the above screen­shot that the chap­ter is split in four files: one for each of the three scenes and a fourth to put them togeth­er). Files are named with a one-let­ter pre­fix based on the act (A, B, or C), a num­ber (the chap­ter in that act), and a short name describ­ing the point of that file. Each act has its own file that puts the chap­ters in order (named part-A.tex, part-B.tex, and part-C.tex). LaTeX is a pain to work with direct­ly (it pol­lutes the work­ing direc­to­ry and has no depen­den­cy man­age­ment) but CMake solves both of these prob­lems. CMake doesn’t sup­port LaTeX out of the box, but I hacked togeth­er a mod­ule to man­age LaTeX projects. The first four lines let me pro­duce man­u­script-for­mat­ted out­put for either the whole nov­el or indi­vid­ual acts, the bot­tom three pro­duce type­set con­tent, type­set con­tent for a 6″ x 9″ page (per the require­ments on Lulu), and indi­vid­ual chap­ters (for post­ing to Scri­bophile). The main tar­gets I lever­age are the first four, most­ly because man­u­script for­mats build much faster than non-man­u­script for­mats. Using LaTeX means I get lots of slick fea­tures when I gen­er­ate the type­set out­put, includ­ing kern­ing, hyphen­ation, lig­a­tures, old-style numer­als, and micro-typog­ra­phy (this adjusts things like the spac­ing with­in words and over­flow­ing into the mar­gins to get white­space that looks uni­form to the human eye). Both type­set and man­u­script forms lever­age LaTeX fea­tures like the csquotes pack­age (auto­mat­i­cal­ly man­ages quote match­ing across lan­guages, includ­ing nest­ed quotes). Each tar­get can be built in pdf, html, or odt. I can also gen­er­ate “full” ver­sions which include some post-pro­cess­ing on the out­put, but that’s only required for the full man­u­script (required to gen­er­ate Spe­cial Char­ac­ters). You can com­pare chap­ter 2 of The Howl of the Wolf in both man­u­script and type­set for­mats. 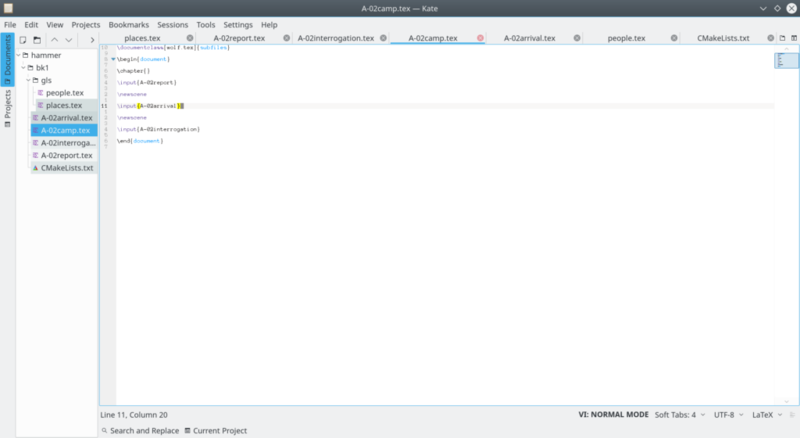 I use apsell for spellcheck­ing and inte­grate it with cmake using a cus­tom com­mand. If you don’t speak geek, this runs the entire project through aspell using a cus­tom dic­tio­nary iso­lat­ed to that project. My cur­rent plan is to delete the dic­tio­nary and run a clean spellcheck before pub­lish­ing (just in case I acci­den­tal­ly added a word by mis­take), but for now I can tol­er­ate a few spelling errors. I have a few scripts to help with analy­sis and file man­age­ment. The most obvi­ous exam­ple is word counts (split­ting chapters/acts across lots of files makes this hard). All changes are tracked using git. Before post­ing any­thing to Scri­bophile I run it through Pro Writ­ing Aid to help with gram­mar and style. If you haven’t tried Pro Writ­ing Aid give it a shot, the site is amaz­ing (it found the exact same sen­tence being used twice in the same chap­ter; not sim­i­lar, the exact same). I usu­al­ly work through one report at a time, updat­ing my raw files and gen­er­at­ing new out­put as I go to make sure I don’t miss any­thing. After going through Pro Writ­ing Aid I check for trou­ble­some words. When I’m done clean­ing those up I do one last check through spellcheck and Pro Writ­ing Aid to make sure I didn’t intro­duce new prob­lems. Once the san­i­ty check is done I spit out the chap­ter in html (eas­i­er than deal­ing with copy/pasting through a pdf) and copy/paste in Scri­bophile.